A real time online yacht charter booking platform. On the client side, we provide a real time service to our customers, that significantly speeds up the booking process, and enhances the overall experience, by eliminating the unnecessary communication and improving the customer experience. On the other side, we provide a fully customizable CRM solution for every service provider, so they can efficiently manage their fleet, no matter whether it is already being present on our platform or not. We provide our partners with a dedicated application, that keeps them engaged with their business, even when they do not have an access to their computer. CharterClick has been running in a test mode since December of 2016. Since then, we have completed around 700 successful online transactions, and have obtained a significant number of returning customers. The target customer we have in mind is tech savvy, 18 - 60, middle/upper middle class European/Asian/American/Arab/Citizen Of The World, looking for a perfect solo getaway or a holiday with his/hers family - usually either for a day or two, or for the whole week. They are usually a marine/yacht enthusiast, who know that a yacht trip can provide them with a completely different experience from a usual hotel stay. Even though the yacht charter market is considered to be pretty niche, it is still pretty lucrative - the overall size of a corresponding market was 31 BN USD by the end of 2017, and has undoubtedly been growing every year. When envisioning the final product, we tried to come up with the optimal solution to a couple of problems that currently exist on a yacht charter market - one of them is the strong fragmentation of different aspects of yacht charter industry, while the other is the clunkiness of the usual process of online yacht charter bookings. There are currently no products on the market that would provide marine enthusiasts, boat owners and third party agents with an ultimate solution when it comes to marine tourism practices. 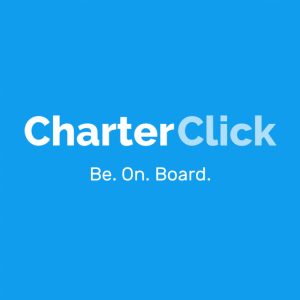 By creating a modern booking platform with an attached internal CRM system, along with a personal supplier database, we at CharterClick are aiming at bridging the gap between end users and yacht charter suppliers, by providing both sides with a one stop destination, that unifies all the available possibilities of the current yacht charter market, and conveniently delivers them to the appropriate party. Judging by the overall surge in digital sales in travel/service/transportation industries, we believe that by providing a simple, convenient and familiar solution to our clients, we will be able to steadily grow the company and its potential on the worldwide market. Make a booking - The user selects the city/marina where he/she wants to book a boat in. The user chooses the the booking type (hourly/daily/weekly), number of adults and children on board, date of the trip and its duration. By using all these search criteria, the system shows the list of available boats to the user. User finds the boat from the list of available ones, proceeds to the payment getaway page to finalise the order and pay for the boat, by entering all the necessary financial information. The system automatically sends a confirmation with a Google Maps pin and a direct phone number of the boat’s captain to user’s inbox. By significantly simplifying the process of a yacht charter booking, we acquire an advantage over our closest competition and the overall obsolete state of the current yacht charter booking process. By creating a new precedent on the market, we slowly shift the inevitable exodus of the yacht charter booking business into the digital plain. Because online sales make the biggest part of our revenue split, we consider online booking platforms to be our biggest competitors on the market. After extensive research, we recognized specific companies in the same industry category, that provide similar offers. These companies are Zizooboats GMbH, Yachtico Inc and Sailogy S.A. All have an extensive fleet, customer database and are well-established on the market. After analyzing our biggest competitors on both local and international markets, we concluded that, although general principles of implementing our business practices in yacht charter business may have some similarities with the companies who already exist on the market, our success would solely depend on coming up with innovative and efficient solutions, that would not only differentiate us from other companies, but would also act as our definitive competitive advantages over them. Strong GCC presence - CharterClick acquired its first service providers and boats in Dubai - one of the fastest developing cities in the whole world. One of the reasons we started here was the direct hands-on access to our first service providers and users, that allowed us to monitor and refine the experience of both our clients and partners in real time. The true potential of yacht charters in the region has not been fully realized yet, and although our competitors claim that they have a presence here, their footprint is almost non-existent - in part because all of them are based out of the area, and were not able to penetrate the local market due to its uniqueness. This gives CharterClick a huge advantage in the region, along with an opportunity to have a real developing market, where we are able to implement our new features and monitor/tweak them without disrupting our worldwide operations. Plus, the fast development of the region in terms of tourism and luxury leisure gives us a big thriving market, with almost no competition in sight. During the inception phase we made a distinctive decision not to pursue any business activities, and to fully concentrate our attention on understanding the problem yacht charter market is facing, to design and bring to life an appropriate solution to that problem. Solving that would not be possible by just creating the platform and operating in the vacuum, and that’s why we brought a number of partners with us on board - first locally, and then internationally. We have, however, generated a revenue of 295000 USD during this test period. Other significant development indicators are a number of partners on the platform (around 1000), number of vessels available for sale (around 8000) and the number of countries we operate in (55). We are receiving a commission of 20% from every booking that is being made through CharterClick in UAE - when it comes to the rest of the world, the average commission is around 13% - 15%, due to the difference in average ticket. Please note, that most of the tests were conducted in UAE. In the future, as we prepare to implement more features into our online eco system, we are expecting to create a lot more opportunities for monetization, that would be constantly generating a cash flow. As a next step, we are planning to open up our yacht charter database for all the third-party agents that are currently working independently on the market. They will have a free access to our system that will include the monitoring of online availability for the whole fleet that is being listed on CharterClick and will receive the commission for every booking made. In case the agent is willing to pull our database to his own portal and know availability automatically, he will have to pay a fee. To get an access to agent database, yacht charter companies will have to pay a subscription fee as well, depending on the size of their fleet. In a long term, we are planning to create a dedicated section for people who are looking to sell/buy new and used boats. That would work in a form of a marketplace, where they would be able to check the basic information about boats, and, if they’d like to proceed with the transaction, acquire all the additional details to make the payment. CharterClick will have a percentage from every sale done through the website. Another future addition is a separate section for super yachts and its management - as we have already witnessed, the process of dealing with super yachts differs significantly from yacht charter business, thus requiring its own dedicated section on the website and a dedicated team. Finally, we would also like to introduce a separate crew section, where people would have a chance to connect with each other, and possibly find their next employment opportunity. As we develop our business practices further, there would be more and more new possibilities to maximize monetization of CharterClick’s model of operation. Web/Application/CRM development, marketing strategy implementation, operational expenses, additional recruitment and a worldwide operation launch of the website. As a startup, we are naturally facing a number of common business risks: market risk, sales risk, financial risk, long-term competition risk, etc. We have not been a member of any Incubation/Acceleration program yet.